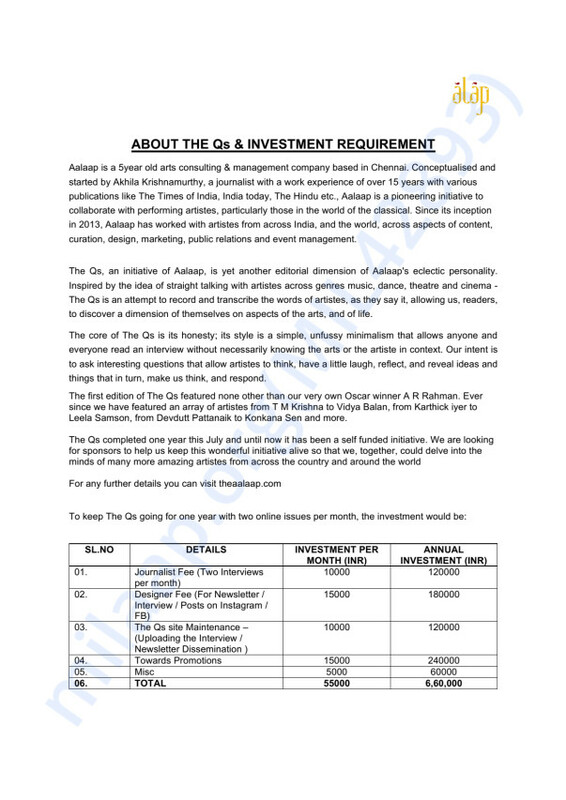 The Qs, an initiative of Aalaap. Aalaap is a 5year old arts consulting & management company based in Chennai. Conceptualised and started by Akhila Krishnamurthy, a journalist with a work experience of over 15 years with various publications like The Times of India, India today, The Hindu etc., Aalaap is a pioneering initiative to collaborate with performing artistes, particularly those in the world of the classical. Since its inception in 2013, Aalaap has worked with artistes from across India, and the world, across aspects of content, curation, design, marketing, public relations and event management. The Qs, an initiative of Aalaap, is yet another editorial dimension of Aalaap's eclectic personality. Inspired by the idea of straight talking with artistes across genres music, dance, theatre and cinema - The Qs is an attempt to record and transcribe the words of artistes, as they say it, allowing us, readers, to discover a dimension of themselves on aspects of the arts, and of life. The first edition of The Qs featured none other than our very own Oscar winner A R Rahman. Ever since we have featured an array of artistes from T M Krishna to Vidya Balan, from Karthick iyer to Leela Samson, from Devdutt Pattanaik to Konkana Sen and more. This campaign has been an eye opener. It has really helped us to reach out to people for support and many of you have come forward and done your bit. Thanks a lot. The funds collected have been useful in taking care of the expenses that we have incurred for The Qs for a couple of months definitely. The funds will be used to pay our designer, our editorial team and the tech team who run and maintain the page. Thank you very much for your contribution towards The Qs. We are so overwhelmed with your spontaneity, generosity of spirit and your contribution. Your faith in us has reinforced our desire to further grow and nurture The Qs. We hope you will remain our patron, forever. We will utilise the funds towards compensating our team of writers, designers, development team and towards promoting our interviews in a manner that is true to the spirit of Aalaap. From the bottom of my heart I wish you all the very best in your journey! May your dreams come true! Hey dude, here is a tiny something that I could for my belief in you and Aalaap...!!! Keep it going...!!! Congratulations on completing one year of the Q's! Here's to many more!